Director Abi Varghese tries to dish out something believing that the viewers will lap it up just because it is offbeat, writes Paresh C Palicha. "Your film is like your life, both don’t have a story", a lowly distributor of B grade Malayalam films in the USA tells a indie filmmaker after watching a few scenes of his film. 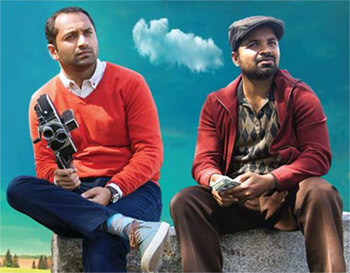 This scene is from Monsoon Mangoes starring Fahadh Faasil, where he plays a indie filmmaker, who wishes to be appreciated even before his talent is brought to the fore. He puts on the standard argument with the distributor that he should see the whole film and a bit of editing is what it needs. We do not have anything against indie or experimental films as long as they are sincere attempts to produce something unique. However, here we feel the director Abi Varghese tries to dish out something believing that the viewers will lap it up just because it is offbeat. D P Pallikkal (Fahadh Faasil) is in his early thirties and beleives that he will be a director one day in the league of Steven Spielberg, Satyajit Ray and Padmarajan. His father takes him to a psychiatrist believing that it will improve the situation, but the son returns empty handed after giving the doctor a piece of his mind. This film is set in the early nineties - an era when making films was a physical and financial struggle. Working on an antique PC, the hero is seen inserting a floppy disk marked Monsoon Mangoes into the drive and gives the print command. He loses his job because of this as the printer is placed in his Boss’ office. He does not seem to be concerned about losing his job but he asks for the print outs before leaving the place. Now, as if a boon from the skies, he comes to know that the erstwhile superstar of Hindi cinema Premkumar (Vijay Raaz) has shifted to the neighbourhood to be with his sons’s family. So the director makes an honest effort to pitch the script to him and get on to making the film. He somehow gets lucky and the shooting begins. The story seems to go into a perpetual loop showing the difficulty of shooting a dream film with a motley crew that claims to be professional and talented. The struggle to conceive a dream project and bringing it to reality is an arduous task. But the way it is conveyed does not feel gripping for a viewer. Most of it looks tacky and pretentious as the frames are jaded. As far as Fahadh Faasil’s performance is concerned, it reminds us of Olipporu (2013) in which he played an anonymous blogger. When the film got sharp reactions from his fans, he confessed on the social media that he had made an error of judgement in doing that film. Well, we just hope that this film does not have the same fate.